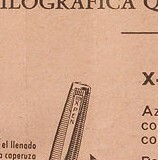 Waterman's French-made "X-Pen" might also be dubbed "the other capillary-filler". 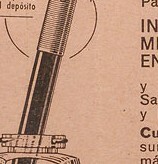 Introduced shortly after Parker's rollout of its capillary-filling 61, Waterman's version was more conservatively styled, mechanically simpler, and predominantly pitched at the economy end of the market. Whereas the Parker 61's capillary reservoir contained a rolled sheet of carefully pierced and textured plastic, the X-Pen's reservoir was packed with what appears to be ordinary, loosely-woven, cotton fabric -- not nearly as effective, and not nearly as durable (the stacked fabric disks in the demonstrator shown below, for example, have shrunk and separated). 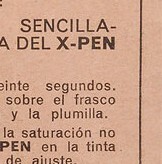 Unlike the 61, which was filled by removing the barrel and dipping the capillary reservoir inside, the X-Pen was not designed to be disassembled, and was filled by dipping the nib instead. 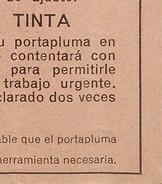 Although the original instructions below state that a dip of twenty seconds is sufficient, a minute or more may be necessary for complete filling. 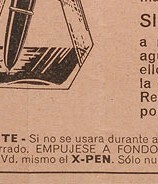 Although some late-production X-Pens with removable barrels (such as the demonstrator shown below) can be flushed out like a 61, using a rubber bulb to force water through the capillary reservoir, most X-Pens must be cleaned by soaking and then emptying -- either by shaking, or by drawing out the reservoir's contents by resting the nib on a paper towel. 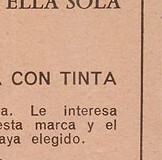 The Spanish instructions below appear on the other side of the English instructions above.